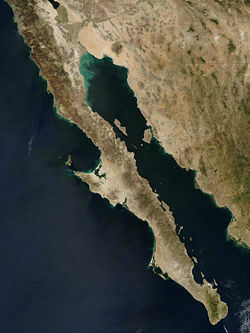 Satellite view of Baja California peninsula. The Baja California peninsula, (also Lower California peninsula) is a North American peninsula, politically a part of the nation of Mexico. Extending approximately 760 miles (1,220 km) in length and 25 to 150 miles (40 to 240 km) in width, it separates the Pacific Ocean from the Gulf of California (or "Sea of Cortés"). Surrounded by numerous small islands, its 2,038 miles (3,280 km) of coastline enclose an area of approximately 55,366 square miles (143,396 square km). Known for its sheltered coves, secluded beaches and rugged mountains and deserts, the peninsula is also home to some of the best preserved rock art in the world. The approximately 250 painted sites became a UNESCO World Heritage Site in 1993. Sometimes termed the "Lower California" peninsula, it serves to separate the Gulf of California (also known as the Sea of Cortez) on its west from the Pacific Ocean on its south and east. It is bounded to the north by the United States. Politically, it is divided into the Mexican states of Baja California and Baja California Sur. The peninsula extends approximately 760 miles (1,220 km) in length and is 25 to 150 miles (40 to 240 km) in width. Its area is approximately 55,366 square miles (143,396 square km), with 2,038 miles (3,280 km) of coastline. It is surrounded by numerous small islands. The Colorado River is its main source of surface water, with the exception of a few streams in the northwest and extreme south. A series of mountain ranges runs the length of the peninsula, which are known as the Peninsular Ranges, and extend into Southern California. The Sierra Juárez is the northernmost range in Mexico. The Sierra San Pedro Mártir lies south of the Sierra Juárez, and is higher. The highest point is Cerro de la Encantada, 3096 m.
The volcanic complex of Tres Virgenes lies in Baja California Sur, near the border with Baja California state. The Sierra de la Giganta runs along the shore of the Gulf of California south of Tres Virgenes. At the south end of Baja California Sur, the Sierra de la Laguna forms an isolated mountain range rising to 2406 m.
The Bahía de los Ángeles is a bay located on the east side of the peninsula facing the Gulf of California. The peninsula is home to several distinct ecoregions. Most of the peninsula is desert and xeric shrubland, although pine-oak forests are found in the mountains at the northern and southern ends of the peninsula. The southern tip of the peninsula, which was formerly an island, has many species with affinities to tropical Mexico. California chaparral and woodlands, which covers the Mediterranean climate northwestern corner of the peninsula, as well as Cedros and Guadalupe islands. Sierra Juarez and San Pedro Martir pine-oak forests in the upper reaches of the Sierra Juárez and Sierra San Pedro Mártir ranges in the northern peninsula. The Sonoran Desert extends into the northeastern portion of the state, east of the Sierra Juárez and Sierra San Pedro Mártir. The Baja California Desert extends along the Pacific side of the peninsula for most of its length. The Gulf of California xeric scrub extends along the Gulf of California side of the peninsula for most of its length. San Lucan xeric scrub lies in the lowlands of the peninsula's southern tip. Sierra de la Laguna dry forests are found on the lower slopes of the Sierra de la Laguna. Sierra de la Laguna pine-oak forests are found at higher elevations in the Sierra de la Laguna. The Baja California peninsula was once a part of the North American Plate, the tectonic plate of which mainland Mexico remains a part. About five million years ago, the East Pacific Rise began cutting into the margin of the North American Plate, initiating the separation of the peninsula from it. Thereafter, the East Pacific Rise continued to propagate northward, up through what is now the Gulf of California. The propagating tip of the spreading center is now located somewhere in the Salton Sea basin. The Baja California peninsula is now part of the Pacific Plate and is moving with it away from the East Pacific Rise in a north northwestward direction. It is an ongoing example of a type of crustal block known as a terrane. The Rock Paintings of Sierra de San Francisco is a UNESCO World Heritage Site on the Baja Peninsula. This prehistoric rock art, found in the Sierra de San francisco region, are representations of what was once the life of the Indigenous Cochimi or Guachimi in the peninsula. Little is known about this group, apart from the fact that they came from further north. These paintings, which vary in origin from 1100 B.C.E. to 1300 C.E., are found on the roofs of rock shelters and on the walls of Sierra de San Francisco. They were first discovered by the Jesuit Francisco Javier in the eighteenth century. The property is made up of approximately 250 sites which are located in the municipality of Mulege within the El Vizcaino Biosphere Reserve. The area's isolated location has protected them from vandalism. The content of these paintings includes religious content as well as weapons and animal species such as rabbit, puma, lynx, deer, wild goat/sheep, whale, turtle, tuna, sardine, octopus, eagle and pelican; there are also abstract elements of various forms. The area has the most important concentration of prehispanic art in the Baja California Peninsula. It is of exceptional quality at both national and international scale, for its high quality, its extent, the variety and originality of human and animal representations, its remarkable colors, and its excellent state of preservation. The rock paintings of Sierra de San Francisco were nominated in 1989 and became a World Heritage Site in 1993. There is evidence of humans inhabiting the Baja California peninsula as far back as 9,000 to 10,000 years ago. The area would have been more humid at that time, with huge Pleistocene mammals roaming the area. At the time of European discovery of the peninsula, some of the most primitive tribal cultures in the Americas were residing there. Following Hernán Cortés conquest of Mexico, the lure of an earthly paradise as well as the search for the fabled Strait of Anián, helped motivate him to send several expeditions to the west coast of New Spain in the 1530s and early 1540s. The first expedition reached the Gulf of California and Baja California, and proved the "Island of California" was in fact a peninsula. Nevertheless, the idea of the island persisted for well over a century and was included in many maps. The Spaniards gave the name "California" to the peninsula and to the lands north, including both Baja California and Alta California, the region that became parts of the present-day U.S. states of California, Nevada, and others. As Spain laid claim to the peninsula, 60,000 to 70,000 Indians lived on the land. Residing in generally small villages, they subsisted on a fishing and hunter-gatherer lifestyle. Unable to successfully colonize the peninsula, Jesuit missionaries were sent to establish permanent settlements at Loreto in 1697. The missionaries were able to gather the individual clans, clothe and catechize them. However, the native peoples were nearly wiped out due to a series of epidemics introduced by the Spaniards. In 1768 Franciscans replaced the Jesuits, but lasted only five years before the Dominican order replaced them. By the time the Dominicans arrived, the native population in the south had been nearly decimated. They concentrated on founding new missions in the north and reaching those tribes which had little contact with the Europeans until that time. Baja California gained its independence from Spain in 1822. Following this, the missions were gradually abandoned. Mestizo farmers and cattlemen began to fill up the peninsula. After the Mexican War of 1846–48, the Treaty of Guadalupe Hidalgo gave California proper to the United States and assigned Lower California, meaning the Baja peninsula, to Mexico. Marker erected in honor of the Upper-Lower California partition. The marker reads, in part, "This was the starting point for the setting of the first international division line between Old or Lower California (Dominicans) and New or Upper California (Franciscans) five leagues to the north (Valley of the Medanos) being established by: Priest Francisco Palou on 19 August 1773 (Mojonera of Palou) in compliance with the instructions put forth on the April 7 1772 Concordato." New Spain's province of California was divided into Alta California and Baja California on August 19, 1773, near San Juan Bautista Creek by Fray Francisco Palóu. In May 1990 the Rosarito Historical Society erected a marker at the point in which the dividing committee began the measurements for the province's partition. 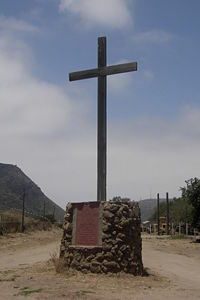 The marker is behind the Misión San Miguel Arcángel de la Frontera, near Ensenada, Baja California. 1532: Hernán Cortés sends three ships north along the coast of Mexico in search of the Island of California. The three ships disappear without a trace. 1533: Cortés sends a follow-up mission to search for the lost ships. Pilot Fortún Ximénez leads a mutiny and founds a settlement in the Bay of La Paz before being killed. 1539: Francisco de Ulloa explores both coasts. 1804: The Spanish colony of California is divided into Alta ("Upper") and Baja ("Lower") California. In 1850, after Alta California has been annexed by the United States, Baja California is further divided into northern and southern territories. 1853: William Walker, with 45 men, captures the capital city of La Paz and declares himself President of the Republic of Lower California. Mexico forces him to retreat a few months later. 1930: Baja California is further divided into Northern and Southern territories. 1952: The North Territory of Baja California becomes the 29th state of Mexico, Baja California. The southern portion, below 28°N, remains a federally administered territory. 1973: The 1700km (1060 miles) long Trans-Peninsular Highway (Mexican Federal Highway 1), is finished. It is the first paved road that spans the entire peninsula. The highway was built by the Mexican government to improve Baja's economy and increase tourism. 1974: The South Territory of Baja California becomes the 31st state, Baja California Sur. The northern part is the state of Baja California. The citizens of Baja California are named Baja-Californiano (Lower-Californian in English). The southern part, below 28° north, is the state of Baja California Sur. The citizens of Baja California Sur are named Sud-Californiano (South-Californian in English). The Baja California peninsula hosts a natural World Heritage Site, three biosphere reserves, nine national protected areas, essential turtle habitats and gray whale nurseries. However, rapid development in the areas of industry and tourism, overfishing and overexploitation of water resources, and understaffing and underfunding of protected areas threaten the state of its natural environment. There is a need for more long-term planning for environmental management, increased enforcement of the law, the creation of reserves and management plans, implementation of specific management programs, and increased protection and monitoring of endangered species. ↑ 1.0 1.1 1.2 Encyclopædia Britannica Online, 2008, Baja California Retrieved May 9, 2008. ↑ Cabobob enterprises, The Baja Highway Retrieved May 10, 2008. ↑ Jack Barkenbus, The Trans-Peninsular Highway: A New Era for Baja California, Journal of Interamerican Studies and World Affairs, Vol. 16, No. 3. (Aug., 1974), pp. 259-273. ↑ Baja California is sometimes informally referred to as Baja California Norte, to distinguish it from both the Baja California peninsula, of which it forms the northern half, and Baja California Sur, the adjacent state that covers the southern half of the peninsula. While it is a well-established term for the northern half of the Baja California peninsula, however, its usage would not be correct, because Baja California Norte has never existed as a political designation for a state, territory, district or region. ↑ Pro Peninsula, Conserving the unique natural environment of the Baja California peninsula Retrieved May 10, 2008. Pro Peninsula. Conserving the unique natural environment of the Baja California peninsula Retrieved May 10, 2008. MEXonline.com. Baja California Directory and Information Retrieved May 10, 2008. The Columbia Encyclopedia, Sixth Edition. Baja California, peninsula, Mexico Bartleby.com. Retrieved May 10, 2008. All links retrieved May 9, 2016. This page was last modified on 9 May 2016, at 18:21.